For quantitative determination of phospholipid and evaluation of drug effects on its metabolism. • Sensitive. Use 20 μL samples. Linear detection range: colorimetric assay 3 - 200 μM, fluorimetric assay 0.6 - 20 μM phospholipid. Phospholipids are a class of lipids which constitute a major component of cell membranes and play important roles in signal transduction. Most phospholipids contain one diglyceride, a phosphate group, and one choline. BioAssay Systems’ method provides a simple, direct and high-throughput assay for measuring choline-containing phospholipids in biological samples. In this assay, phospholipids (such as lecithin, lysolecithin and sphingomyelin) are enzymatically hydrolyzed to choline which is determined using choline oxidase and a H2O2 specific dye. 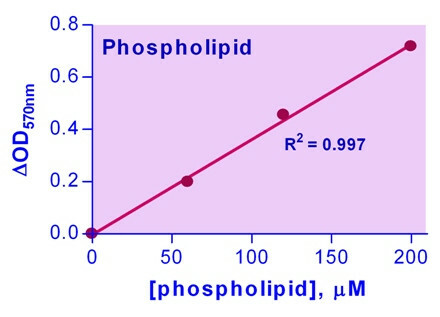 The optical density of the pink colored product at 570nm or fluorescence intensity (530/585 nm) is directly proportional to the phospholipid concentration in the sample. Applications For quantitative determination of phospholipid and evaluation of drug effects on its metabolism. References Assay: Phospholipid in Human Red blood cell (Pubmed). 2. Kim S et al (2012) Aberrant upregulation of astroglial ceramide potentiates oligodendrocyte injury. Brain Pathol 22(1):41-47. 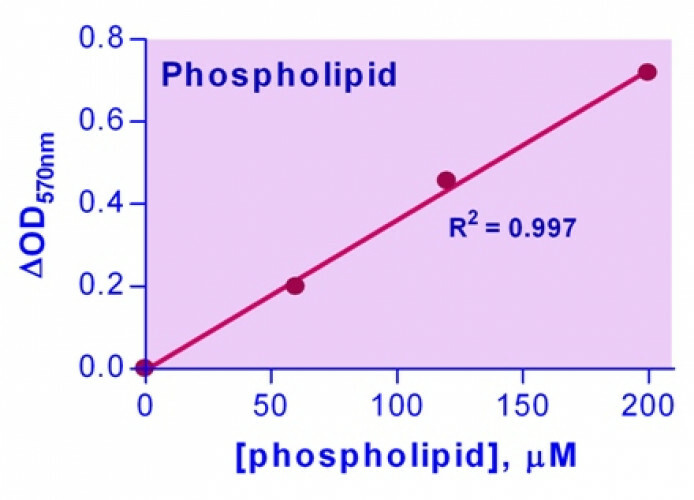 Assay: Phospholipid in N/A lipid (Pubmed). 3. Soga N et al (2012) Kinetic equivalence of transmembrane pH and electrical potential differences in ATP synthesis. J Biol Chem 287(12):9633-9. Assay: Phospholipid in human cancer cell (Pubmed). 4. Haynes TA et al (2012) DNA damage induces down-regulation of UDP-glucose ceramide glucosyltransferase, increases ceramide levels and triggers apoptosis in p53-deficient cancer cells. Biochim Biophys Acta 1821(7):943-53. Assay: Phospholipid in Human Ovarian cancer cells (Pubmed). 5. Stoll C et al (2011). Liposomes alter thermal phase behavior and composition of red blood cell membranes. Biochim Biophys Acta 1808(1):474-481. Assay: Phospholipid in Mouse Brain (Pubmed). 1. Methods for treatment of a sarcoma using an epimetabolic shifter (Coenzyme q10. US 2011/0064747. Assay: Phospholipid in Human Red blood cell (Pubmed).